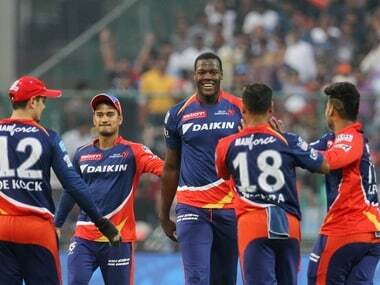 New Delhi: With Delhi Daredevils surprising one and all with their consistent show in IPL-9, West Indies all-rounder Carlos Brathwaite on Saturday said they now have a "fun dressing room" and it is helping them play well this year. Brathwaite made a good comeback to the side after missing two games, scoring crucial 34 off 11 balls and taking three wickets. "I won't talk about past since I was not there but this year there is lot of stress on processes and solid preparations. It's a fun dressing room. Then players are good friends off the field and that unites them on the field under pressure," the West Indies batsman said. Brathwaite also stressed that he was not dropped from the side in previous games. "It's horses for courses. Imran Tahir did not play today but it's not that he was dropped. I was not dropped. Only thing is that only four foreign players can play but still the one who is missing out gives same support to the team." 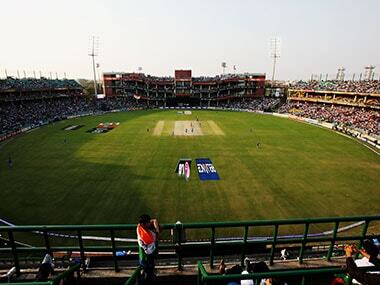 Brathwaite also said that Feroz Shah Kotla track's changed nature suited his batting style. "Then pitch was true. But Karun Nair and Sam Billings allowed me to bat where I wanted to bat. They laid the foundation," he said of their 105-run stand for the fourth wicket which helped them post 186-8 after being 32-3 in 5 overs. He also said he does not put himself under pressure and it was not possible to get big shots everytime he comes to the crease. "It does not happen everyday," he said when reminded of his breathtaking 10-ball 34 that helped West Indies win the World T20.